Unchained is a stunning action role-playing game from FourThirtyThree inc. Featuring your favorite characters from the DC universe, the game lets you build a team or superheroes and supervillains to fight an army of Parademons. Story missions are fun to play, especially when you can play the same mission as heroes and villains. You can control a character using a virtual joystick, use deadly skills to beat up wily baddies and tag another superhero to continue your attack streak. The game’s top-down visuals are brilliant to say the least and characters just look amazing when they perform their signature moves. DC Unchained has several game modes, including a co-op mode that lets you team up with other players to complete challenging maps for rewards. There’s also simulation combat that tests how good you are in using your characters and skills. There’s also a PvP AI battle mode that pits you against other players in an exciting one-on-one battle. If you have just begun your adventure, then you will get a lot of help from guide. You can combine skills of a character to deal massive damage to enemies. To do this, you should have at least two active skills. Tap the first skill. When your character performs the first skill, quickly tap the second one. Try this on Batman. While fighting baddies, tap his “Batarang” skill. As he throws batarangs, quickly tap the Dark Knight skill. Chaining skills leads to surprising effects, so you can try this trick on other characters. The Trial arena is the best place to experiment chain skills – Tap Team and then tap a character. Now tap “Unique Skill” and press the “Free Trial” button. This is where you can try different skill combos on enemies. Tagging a character can be fun if he belongs to the same family. When you tag him, your current character exits but not without attacking enemies. Your new character also makes an explosive entry, beating up multiple enemies. This way you deal double damage to baddies. Try it by bringing your villain team to the battle arena. Tag The Joker with the current character selected as Harley Quinn to see some fireworks. The HP potion (Green heart icon) is located on the bottom of the screen. You will have to fill the potion gauge, which is a circle that surrounds the heart, by performing attack combos. Once full, just tap on the potion icon to increase HP of all team members. Since you have access to only two potions in the entire mission, use them wisely. When you are in enemy territory, tap the attack button (Fist icon). Your character will automatically attack the nearest enemy. Tapping the attack button rapidly will make him perform successive combos. You can check the number of combos on the upper-left corner of the screen. The higher combo you make, the faster the potion gauge fills up. To check how much of the HP potion gauge is filled up, tap the evasion button (foot icon) or stop attacking. 4. Should You Go for Auto Play? DC Unchained’s auto-play mode lets you sit and relax while the AI controls your character and employs skills. The game also boasts a “semi-auto” mode, where the AI will attack any incoming enemy, but won’t use skills. You will have to tap on them to let your character perform skills. There are certain advantages and disadvantages of using auto play mode. One big advantage is that the AI automatically tags another character when the current character’s HP hits below a certain level. However, an AI-controlled character will ignore item crates sometimes, especially those that appear on the way between two arenas. In full auto mode, you won’t have any control on skills as your character starts using any one active skill immediately after its cooldown time is over. You won’t be able to chain skills or experiment with them while battling. I would recommend using auto-play if you are replaying older missions to grind EXP and gold as manuallyplaying them again can be very boring. You can also use auto-play in Unchained mode, but make sure you enter an arena with other players as it will be easy for you to complete a chapter. When you join a guild, you can take along a fellow guild member with you to battle. But the best part of joining a guild is that you receive buffs. This could be a percentage-wise increase in Gold and EXP after a mission ends or an Attack or Defense stats boost. To check buffs that are currently active, tap the menu (three dash icon) on the upper-right corner of the screen and then tap Guild. 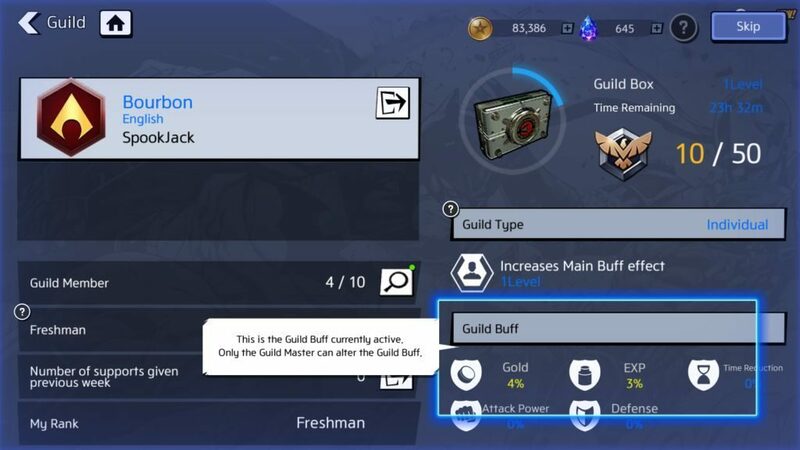 Under “Guild Buffs” you can check what buffs are enabled. Only the Guild master has the ability to change buffs. You can also add a guild member’s character to your team and tag him during a mission. Tap Story Mission and select a chapter. Next, tap a mission and then tap an empty slot under “Friend” to add a guild member. During a mission, tap the portrait of the guild member to summon his character to the battle arena. His superhero/villain will join you in your battle against baddies, but only for a few seconds. I would recommend summoning a guild member at the end of the battle, when the boss appears as your friendly character will start attacking him. Using friend support in areas other than the boss arena wouldn’t be a wise idea. You will receive “Guild Medallions” for getting support of a fellow guild member. Medals can be used to open the Guild box to get rewards; you will need to collect 50 medals to open the box. Fighting parademons can get tough if you don’t have a strong team. 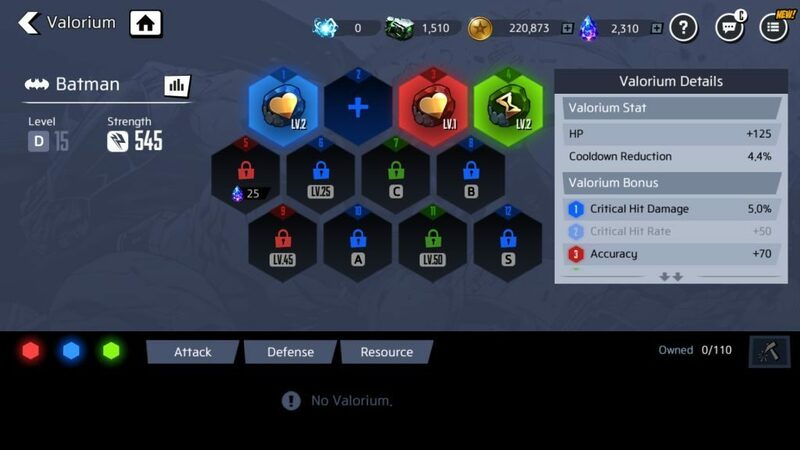 While leveling up characters is one way to increase their stats and team strength, you can also equip “Valorium” to a superhero or villain to make him more powerful – This will ultimately make your party stronger. To get Valoriums, play the Unchained game mode as you might receive them as rewards. To equip this element to a character, tap “Team” on the bottom of the game screen and then tap a character. Next, tap “Valorium” which can be seen below his active skills. Drag a Valorium to a slot that matches its color. Doing this, you will get a matching bonus and also increase his “Strength”. The chart on the left side of the screen shows which stat will get a boost along with the matching color bonus stat. For example, if you have a blue Valorium, just drag it to the empty blue slot to get a Crit Hit damage stat increase. On “Ocean Master” Valorium page, dragging the green element to a green slot will not only increase HP by 100 but also grant stats bonus such as increase in Evasion and Crit Hit damage. The bonus effect of a Valorium varies from one character to the other. To unlock more slots, your character should fulfill certain level and rank conditions. For example: To unlock red slot, you must level up Batman to 15. Skills play a crucial role in battle as it will be tough to fend off multiple enemies in an arena without using them. During boss battles, using the right skill at the right time will reduce his HP considerably. You must upgrade each character’s skill to make it more effective in battle. You will require silver cards to upgrade skills of superheroes and villains. Cards should belong to the same family. In DC Unchained, there are six families – Batman, Wonder Woman, Superman, Aquaman, Flash, and the Green Lantern family. You will have to collect silver cards of a family if you want to upgrade a character that belongs to the same family. 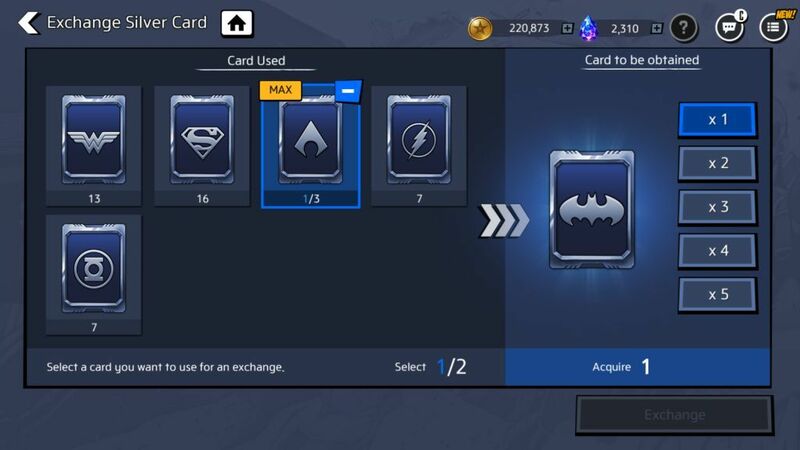 For example, Batman silver cards can be used to upgrade skills of Batman, The Joker, Harley Quinn as all belong to the Batman family in this game. Finish various “Guides” to get Family Silver card tickets. These guides can help you learn different tricks and tactics and explains the ins and outs. You just have to follow and complete them to get rewards. Completing events is another way to get them. Tap “P” located beside the player level bar on the upper-right corner of the screen to get information about the latest events. You may also get cards in certain missions as “One-time” rewards. Go to “Story Mission” and swipe left to check which mission offers one-time rewards. For example, Oolong Island’s mission 16 grants silver card tickets for both heroes and villains. So you can get more cards if you complete the same mission as heroes as well as villains. There’s a slight chance of getting a silver card from a crate, so don’t forget to destroy crates and you never know what reward you might be receiving. You can buy cards from the “Shop”. Tap the “Character Upgrade” tab to purchase silver cards and character packs using in-game gold and gems. You can also get them from the “Timed Product” option. Complete Character, Story and Event achievements to get silver card boxes and cards. To access achievements, tap menu on the lower-left corner of the game screen. You might also get cards as push rewards and pre-registration rewards if you have pre-registered the game before launch. So you have plenty of Aquaman silver cards, but you need more Batman silver cards to upgrade his skill. You can get rid of unwanted cards by trading them with the cards you need. Go to Menu > Exchange and then tap a card that you want. Now tap on the “Select” button and tap the card that you want to give away in exchange for the new card. You will have to sacrifice two cards to get 1 card, so make sure you select only those that you don’t need. You can take a team of 3 characters to a mission and tag a superhero any time during the game. When you tap a character’s portrait, he will replace your current character. You should tap a character’s profile whenever your current superhero’s HP is below a certain level. I tag a character when my superhero’s HP is less than 50 percent. Normally the screen glows red when your character’s HP bar is below a certain level but you should try to tag a character much earlier because if your current superhero is dead, you will have to play the same mission from the beginning. You can use an HP potion, but in case you are out of potions, then you should quickly tag another character. Dc Unchained characters not only possess active and passive skills, but also unique skills. These skills come into effect after fulfilling certain conditions. There’s a separate unique skill tab which is located just above the active skill section on the character profile screen. Each character has a unique “Team member” and “Leader” skill. Leader skill activates when you choose a character as your leader. To select a leader, tap “Team” and then drag a character to the middle to assign him/her as the leader of a team. Choose a team leader wisely. The first criteria of selection should be his unique skill. Try to select a character whose leadership skill activates immediately when you assign him as the leader of your squad. When I began playing, I had only three characters unlocked: Aquaman, Batman and The Flash. I chose Aquaman as my hero team’s leader because his skill was activated immediately whereas the unique leader skill of Batman had additional requirements to activate his leader skill. Each mission/map in story and unchained mode has a numeric value that denotes “strength”. You can see the “recommended” strength when you tap a mission. Your team’s strength should be more than the recommended number if you are really looking forward to win a mission. Your team strength is the total of all three character’s strength value. It will increase if one of your superhero or villain’s strength increases. There are various ways to increase a character’s strength and some of them have been explained in this guide. One easy way to increase team strength is to grind for EXP by replaying older story missions or unchained mode maps. Once your character’s XP bar is full, he levels up and his strength increases a bit. You can also use EXP books to quickly level up a character. You can get them by beating Unchained mode maps. Ranking up a character significantly improves his key stats, such as Attack Power, Physical Defense HP etc. Ranking up will also let you unlock higher skills of certain characters, such as the Flash. Your superhero or villain should reach a particular level and only then you can rank him up. You will also need silver cards to complete the ranking procedure. “Tactics” automate certain offensive and defensive techniques of your characters. You can access this unique feature when you tap a character on your team selection screen. When you equip a tactic to your character you set a combat pattern, which activates when certain conditions are met. For example, a tactic will automatically use HP potion when your character’s HP is low or your character summons a supporter when there are several enemies close by, (in case you have added a supporter before battle begins). You can acquire tactics from the Vision quest and then purchase them using gold, but make sure you have unlocked empty slots. You will need to meet certain level or ranking conditions to unlock them. 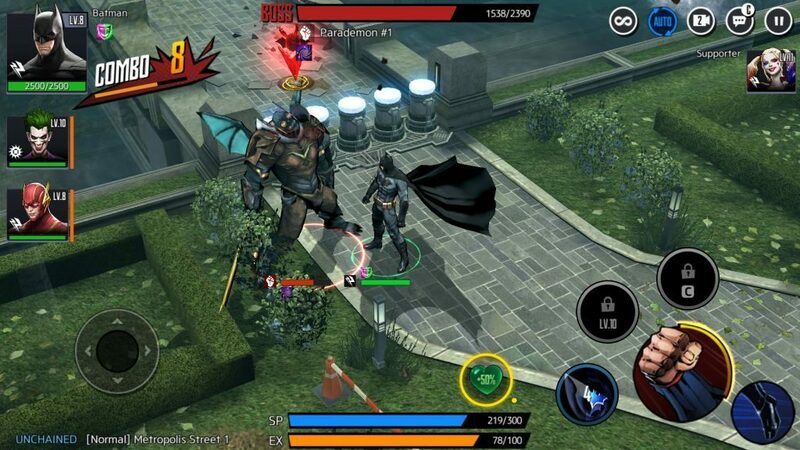 Those were a few tips and tricks that may help you in your fight against parademons. If you have any questions, please ask them via our comments section.